Montini Invasive Species Kept at Bay! The Invasive species removal day was a huge success for both Montini Preserve and the Overlook Trail. In total, 10 crew and volunteers came out to the event, including my Enviroleader Teen crew members and veteran Volunteer Roy Tennant. The group met up at the Montini Water Tanks and dispersed into 3 smaller teams, each equipped with their heavy-duty trash bags as well as a handheld GPS device. In addition to pulling up primarily Yellow Star Thistle, each group documented the location and approximate size of the outbreaks on their digital way points. This information is being transferred to the Sonoma Ecology Center’s Geographical Information staff to be documented and mapped. This is crucial baseline measurement to determine if/and where we are making progress on fighting back the noxious plants from the Preserve. “We are depleting the seed bank each season and things will get easier and easier from here on in until complete eradication”said Roy. Additionally, some of the other invasive plants like Harding Grass have already gone to seed this season but the mapping will give our staff and volunteer crew a jump on locations for 2017 that can be noted on the map below. The primary locations that we dedicated our weeding towards was the rip-rap culvert adjacent to the Water Tanks fire road, the meadow at the Intersection of Spotted Fawn and Rattlesnake Cutoff and some really bad meadows along Norrbom Road on the cusp of both Montini and Overlook. A huge thank you goes out to Roy for his ongoing efforts in weed management. 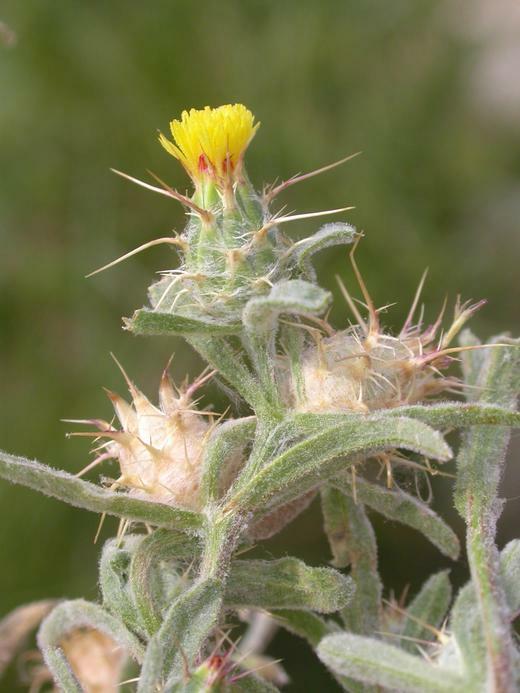 Your quietly diligent efforts at fighting back Yellow Star Thistle at the Montini and Overlook properties for the benefit of both hikers and habitat should not go unnoticed. A thank you to Joanna for getting the word out and supporting the Montini Preserve Volunteer efforts. Look for other outreach events at the Montini Preserve coming later this fall! Invasive species are, generally, non-native species that cause ecological harm to the biodiversity of an area. After human development, invasive species are the second greatest cause of habitat loss in the world. In addition to displacing native plants and animals, invasives can increase fire risk and harbor pests. Thanks to the work of our volunteers across Montini and Overlook Trail, we’ve made huge strides in suppressing the spread of many of the common invasive plants on our park land. However, it takes a community to constantly be vigilant and aggressive in maintaining outbreaks of yellow and purple thistles, harding grass and the other non-natives that threaten the ecological health of our lands. Come out on Friday, July 22nd and work alongside our restoration technicians to help keep our parks clean and free of the spread of invasive plants. Learn about native flora and the impacts of non-natives on our landscape and enjoy a nice day of hiking. We will be starting at the parking lot next to the police station and Field of Dreams off of 1st Street East. Also in attendance will be Sonoma Ecology Center’s high school crew of summer Enviroleaders. These students have been working through their vacation months, becoming young stewards of the land and leaders of their community. Volunteers should bring layered comfortable clothing, sunscreen, and a a water bottle. We will provide gloves and trash bags if needed. Efforts to use reusable items are guided by a desire to reduce the overall event footprint. Children must be accompanied by an adult. For any questions, please call Volunteer Manager, Tony Passantino at at 707-996-0712 x124 or email Tony@sonomaecologycenter.org.